Oliver Carpets have been offering the best service around for all your flooring requirements for many years now and have built up a great reputation for being competitive, helpful and friendly. With offices in Ramsgate, Herne Bay & a warehouse in Ramsgate, you be sure we are always within easy reach. We believe you don't need to wade through thousands of carpets just to choose one. Our idea of shopping is simple..
We only stock the lastest designs & fashions at unbeatable prices. 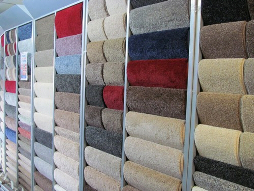 We don't need to do 50% or 70% carpet sales, our prices are competitive all year round. At Oliver Carpets we adopt a different policy ! A don't worry policy !. So no matter what the problem is we make sure it is sorted for you. We constantly have dicounted stock arriving in all branches which is why we can beat our compeditors 95% of the time !